Coaching is like having a mentor, best friend and personal trainer for your mind. It helps you be your authentic self, with inner confidence to achieve what you want, and to feel good about yourself. Whatever area of your life you wish to improve: relationships, social, career, sport, your own personal development etc… coaching can help you. All successful people have used coaches because they know that doing it alone is too difficult. You are kept on track but never judged. Start today to really be who you want and achieve your goals. In order to move you on I may use a combination of Hypnosis, NLP (Neuro-Linguistic Programming), EFT (Emotional Freedom Technique), EMDR, Mindfulness or a little CBT (Cognitive Behavioural Therapy) & Bio-Feedback (I use a software from the Institute of Heartmath). Most people know what they don’t want in their life, however they lack clarity on what they do want. Our first task together is to clarify exactly what you really want for yourself. What’s been holding you back, i.e. limiting beliefs, old patterns? Once you create objectives that are clearly in line with your personal values and vision, you are much more likely to take consistent actions to reach them. Strategies for Couples with Relationship Issues (12/20/2015) - When a relationship breaks down it's nearly always because communication has, so couples need effective strategies to prevent arguments, whilst working on identifying values, visions, obstacles, blind spots and personal development. One useful tool is NonViolent Communication. Hypnosis – A legal way to enhance your performance? (8/2/2015) - I found indications that hypnosis and self-hypnosis are used in Cycling. A scientific study shows that hypnosis appeared to enhance flow intensity and the racing performance of elite cyclists. When your partner loses it, should you blame their Amygdala? (9/23/2012) - Over the years, I find myself explaining more and more just how the brain works. I do it because it can really help clients when they are ‘doing’ or ‘receiving’ unwanted behaviour. For instance, the Amygdala, can hijack your reasoning faculties to the point of losing a job or ruining a relationship, which was happening to a client I had recently, let’s call him John. 10 Mistakes People Make In Relationships (9/6/2009) - You fall in love and feel amazing. Everything is 'just perfect' in your world. Then, what happens? Well, usually, the initial euphoria begins to wear off and gradually those cute little habits s/he has now becomes very irritating! Suddenly there's a feeling of being taken for granted by one or both parties. “My sessions with Denise have been nothing short of transformational” (Mar 2019) - "I’ve had years of anxiety, fear of failure, fear of being judged - and being paralysed by this in my job - periods of depression, being afraid to go out, avoiding social situations, periods of long term sickness, not being bothered to look after myself or respect myself..."
“The EMDR work I did with you has been priceless in regaining myself” (Feb 2019) - "I fully appreciate not only how good and professional you were in the therapy, but also and mostly how amazing, deeply sensitive and great insight you showed in connecting with the deepest part of me, like you had known me the whole of my life..."
“The couple of sessions I have had with you have changed my life beyond my expectations” (Jan 2018) - Denise really helped build my confidence and reduce anxiety levels. Not only have I now managed to secure the job that I wanted, I also feel that I am able to overcome any challenge that may present itself. “Very wide skill set along great intuition allowed Denise to get to the heart of the issue” (Jul 2017) - "Denise was such a joy to work with. She brought a very wide skill set to the sessions, along with great intuition which allowed her to get to the heart of the issue. It was clear to see that she is empathetic and cares deeply about what she does. It is hard not to be buoyed up by her positive energy and warmth - I would thoroughly recommend her!" “The couple of sessions I have had with you have changed my life beyond my expectations” (Jun 2017) - Denise, the couple of sessions I have had with you have changed my life beyond my expectations! Your hypnosis technique is both so gentle and powerful I had no idea its long-term effects would be so beneficial to me — but here am I several weeks down the line, feeling reborn and feeling like I've retrieved my true self. I cannot thank you enough for the priceless recovery you've helped get to, especially considering the rough patch I was going through. I will most heartily recommend your services to anyone that might be looking for a good... sorry, a FANTASTIC therapist: they're in for the best surprise of their life! “I used to link my self-worth with my exam performance” (Jul 2016) - "Before meeting with Denise I had exam anxiety and often linked my self-worth with my exam performance. Since working with Denise, not only has my confidence improved, but I am also much calmer when coping with daily stress/anxieties. 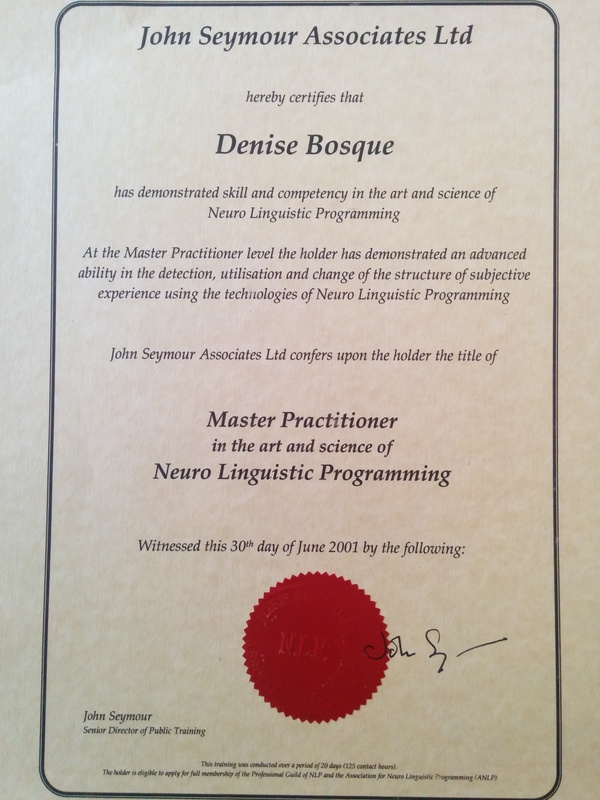 Denise a positive influence and has enabled me to break down and manage exam and other stresses in my life. Thank you for all your help!"